For other people named Frederick Russell, see Frederick Russell (disambiguation). Frederick William Russell, OC, K.St.J, CD, LL.D (September 10, 1923 - June 20, 2001) was a Canadian businessman and the ninth Lieutenant Governor of Newfoundland. Born in St. John's, he studied at Dalhousie University and the Atlantic School for Advanced Business Administration. He was a fighter pilot with the Royal Canadian Air Force during World War II in which he flew the de Havilland Mosquito. He was president of Blue Peter Steamships. He was a member of the Newfoundland Labour Relations Board for over 35 years. He was a founding member of the Royal Canadian Air Cadets in St. John's. From 1991 to 1997, he was the lieutenant-governor of Newfoundland and Labrador. In 1979, he was made a Member of the Order of Canada and was promoted to Officer in 1999. Above a helmet mantled Gules doubled Argent on a wreath of these colours a goat statant Argent armed and unguled Gules its dexter foreleg resting on a closed book bound Gules clasped and charged with a cross moline Or between two bars gemel wavy Argent. Argent a lion rampant Gules armed and langued Argent on a chief wavy Gules two wings conjoined expanded fesswise Argent. 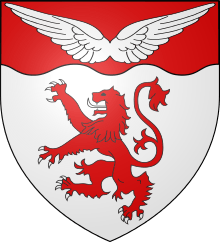 Two lions Gules armed and winged Argent gorged with collars Argent charged with maple leaves Gules. On a rock growing therefrom pitcher plant flowers and tufts of grass proper rising above barry wavy Argent and Azure.